"Detroit's Own" Polar Bear Memorial Association - Articles, Photos & Ref. Info. The Bentley Historical Library's "Polar Bear Expedition Digital Collections" web site has been entirely re-constructed. This interactive site features the digitized "Polar Bear Collections" housed at the University of Michigan's Bentley Historical Library. Back in the 1960s the Bentley Historical Library began collecting personal papers of the Polar Bear veterans through a collaboration with the Polar Bear Association. 1. 63 collections digitized in 2004 by the University Library. 2. 17 collections digitized by the U of M School of Information and Bentley Historical Library. 3. 19 collections digitized by donors. 4. A roster of soldiers who served with the Polar Bears, containing 6,813 names. 5. Collections of books, newspapers, periodicals, and maps digitized from our collection. 6. Links to Polar Bear-related publications digitized by others. Here is a web page containing a list of the U.S. Army officers and enlisted men who served in North Russia. The list is organized by battalions and companies and can be either browsed or searched using the Ctrl+F keyboard command. This list was developed and organized by Lt. Col. Roderick A. Hosler, U.S. Army (Ret.) using the University of Michigan Bentley Historical Library's roster information. "Holland (Michigan) Polar Bear Club - 1948". Contains a transcript of a May 28, 1948 article that appeared the Holland (Mich.) Evening Sentinel about the Holland Polar Bear Club. Also contains a circa 1942 photo of the club. All (38) men in the photo are identified in the article. "Historical Files of the American Expeditionary Force, North Russia, 1918-19, M924". 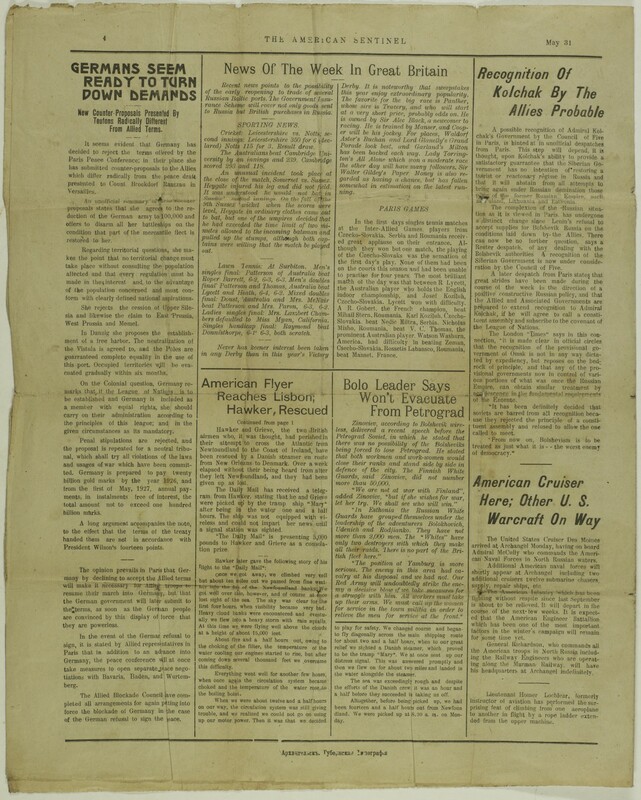 Fold3.com (a subscription-based service), in partnership with the National Archives and Records Administration (NARA), has recently digitized NARA Microfilm Publication M924 and made it available on-line to Footnote subscribers. 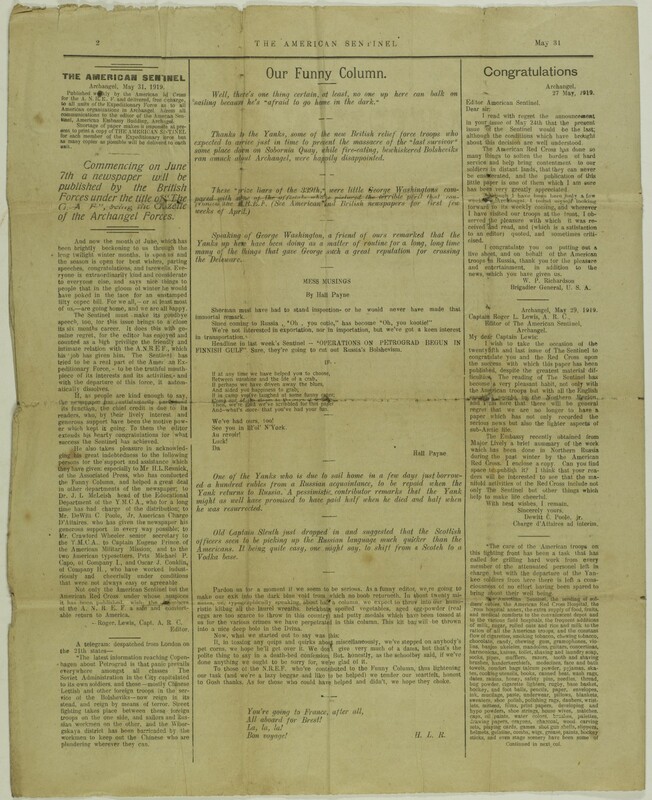 M924, which NARA created in 1973, is a two-roll microfilm publication that reproduced a collection of reports, studies, memorandums, and other records relating to the activities of the American Expeditionary Force, North Russia during 1918 and 1919. This collection, known as the "Historical File of the AEF, North Russia", is part of the Records of the American Expeditionary Forces (World War I), 1917-23, Record Group 120, which is archived at NARA II in College Park, MD. 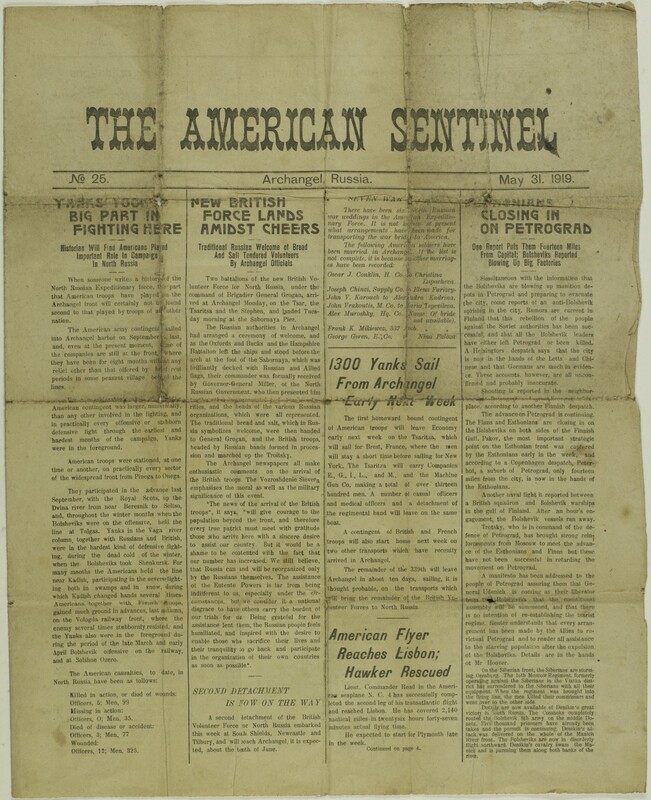 Read the 25th (and final) issue of the "American Sentinel", published in Archangel, Russia on May 31, 1919: Page 1 | Page 2 | Page 3 | Page 4. George Aldous (1873-1957) served with the British Army's Durham Light Infantry in North Russia during the period of October 1918 through June 1919. Pvt. Aldous is third from the right, top row, in this photo of his unit that was taken on 27 April 1919 at Smolny Barracks. George brought this newspaper home with him and it was passed on to his grandson, Ian Aldous, who made these scans of the newspaper and has generously shared them with the Polar Bear Memorial Association. Map of Camp Pontanezen. This camp was the temporary billeting camp for all WW I US Army personnel entering and leaving France through the nearby port of Brest, France. 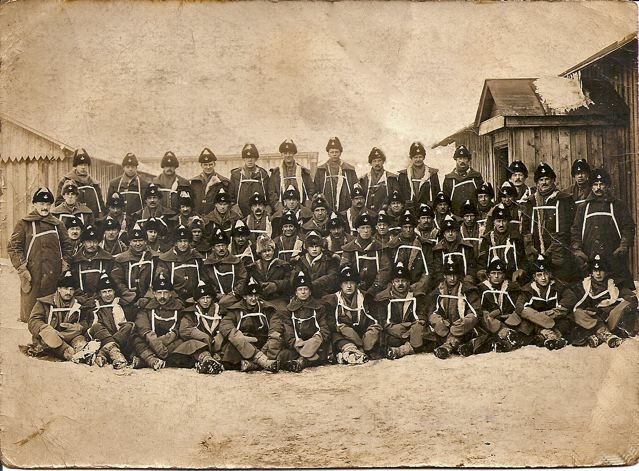 Most of the soldiers of the American North Russia Expeditionary Force passed through Camp Pontanezen on their way home from North Russia in June and July of 1919. 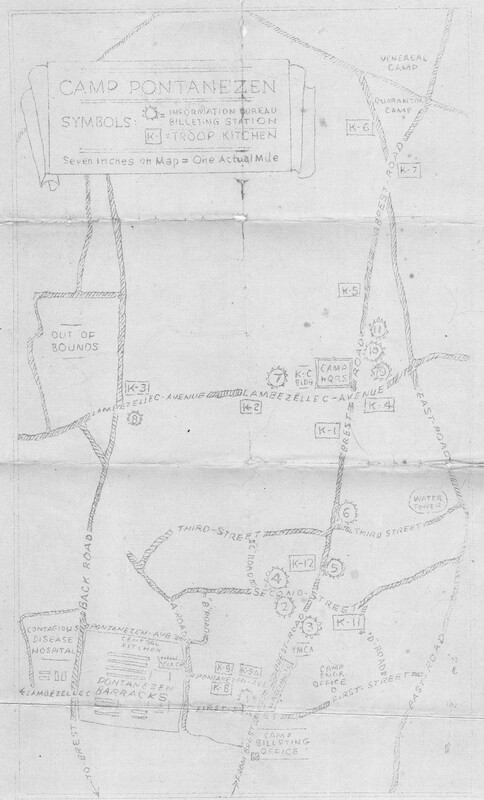 This is a 3 MB scan of a photocopy of the map brought home by an unknown WW I soldier. The map was discovered in an attic by Bill Gouldy of Oklahoma City, OK. Bill contacted the webmaster after finding references to the camp in diary entries featured on this site and graciously offered to provide us with a copy so that we could include it here. U.S. Army Signal Corps photographers shot about 50 minutes of 16 mm black and white silent film documenting the activities of the "Polar Bears" in North Russia during the period of September 1918 to June 1919. Here is a 24 second long series of clips from the Signal Corps footage. More information, including how to purchase the entire 50 minutes of film, can be found here. "Finding photos of the American North Russia Expeditionary Force (ANREF), 1918-1919". Information on the available still and motion pictures taken of the ANREF in North Russia; includes locations of on-line resources and physical archives and also how to order reproductions. "The 'Polar Bears' of World War One - Remembering the Allied Intervention in North Russia". This article was written by the webmaster for the December 2004 and June 2005 issues of the "Polar Bear News". This is the semi-annual newsletter of the "Polar Bear Association", whose members are WW II veterans of the United Kingdom's 49th (West Riding) Infantry Division, which is also known as the "Polar Bears" due to their WW II service in Norway and Iceland. 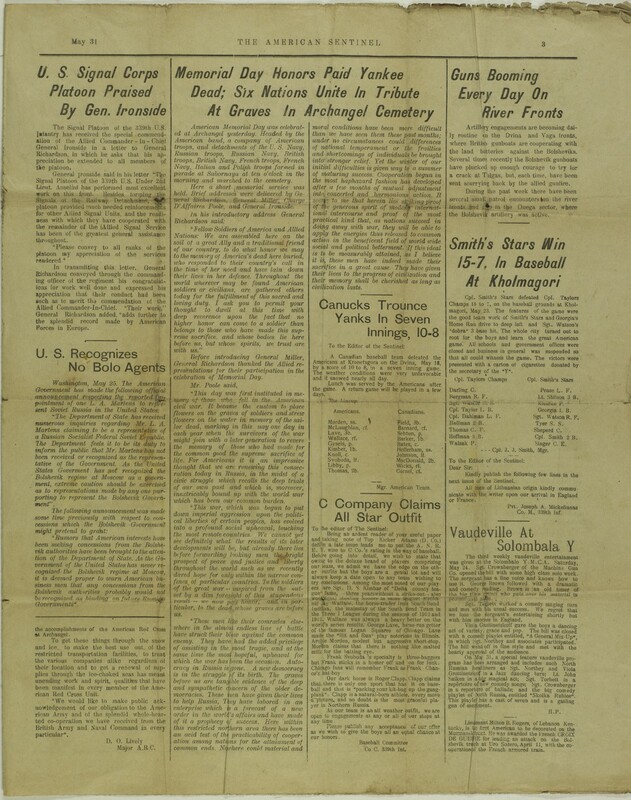 "November 11, 1918 - Armistice Day in Detroit and elsewhere...." - A discussion thread written by the webmaster describing Armistice Day in Detroit and why many familes of Detroit-area soldiers had to wait another seven months to celebrate the end of fighting for their loved ones. "Triggering Intervention: Woodrow Wilson and the American Military Expeditions to Russia" - a research paper written by David M. Kudzia for his Senior Individualized Project at Kalamazoo College. The author, a History major and 2008 graduate, examines President Wilson's reasoning and motives for sending American troops to North Russia and Siberia in the summer of 1918. "America's War in North Russia" - by Col. W.P. Richardson. This article appeared in "Current History - a Monthly Magazine of the New York Times", Vol. XIII, Oct. 1920-March 1921. It describes "what our soldiers did there, told by one of their officers, and based upon both official sources and personal knowledge." "Home from War" - from the archives of Time Magazine, an article that appeared in their Dec. 9, 1929 issue describing the return that week of the remains of 75 U.S. soldiers who had died during the fighting in North Russia ten years earlier. "Inch From Death - Memory of Russia" - an article written by Don Tschirhart that appeared in a Feburary 1959 issue of the Detroit (Michigan) News. The writer interviewed Harry H. Mead, former Lieutenant in Company A, 339th Infantry Regiment, who was wounded during the Bolshevik attack on Shenkursk in January 1919. In 1920, Mr. Mead (along with former 339th officers Joel Moore and Lewis Jahns) wrote the book "The History of the American Expedition Fighting the Bolsheviki - Campaigning in North Russia 1918-1919" [more information here]. This newspaper article mentions that Mr. Mead had been extensively interviewed for an article which had appeared in the December 1958 issue of the American Heritage Magazine. You can read that article by clicking on the link below. "Where Ignorant Armies Clashed by Night" by E.M. Halliday, originally published in "American Heritage Magazine", December 1958, Volume 10, Issue 1. Dr. Roger Crownover, author of “The United States Intervention in North Russia - 1918, 1919: The Polar Bear Odyssey”, gave a lecture on April 16, 2008 at the Troy Museum and Historic Village. He spoke for an hour about the Polar Bears and the intervention in North Russia to members of the Troy Historical Society and members of the general public. The Historical Society made a video recording of his lecture and you can purchase a DVD copy of his talk for $25 by calling Cindy Stewart at (248) 524-1147. "Polar Bear Brigade Fought for Freedom" - a brief article written by Ben Burns that appeared in the Dec. 17, 2007 issue of the Grosse Pointe (Michigan) News. "Tragedy at Archangel - The Amazing Story of America's Futile Expedition Into Bolshevik Land" by Guy Murchie, Jr.; Chicago Sunday Tribune Graphic Section, February 26, 1939. Frederick C. O'Dell Map Collection - Bentley Historical Library, University of Michigan, Ann Arbor, Michigan. These maps were produced by the U.S. Army 310th Engineers mapping section in 1918 and 1919. Links on this page will open photographic images of selected maps from the Collection, which is stored at the Bentley Library and most of which do not appear on their Polar Bear Expedition Digital Collections web site. "Vaga Dvina Junction" Map. A circa 1918 map (in English and with an interesting provenance), that shows the region encompassing the Dvina and Vaga River Fronts. "339th Infantry Permanent Losses - 04 Sept 1918 through 10 May 1919"
"339th Infantry Croix de Guerre Award Ceremony, 17 Feb 1919"
"Photographs of Company I, 339th Infantry"
At the top of each of these pages is the 339th Infantry's regimental insignia crest with their motto written in Russian: "The Bayonet Decides". Click here to view the crest in color and read the full history behind it. "Detroit's Polar Bears & Their Confusing War" - from the Detroit News "Rear View Mirror" series. Click here to view a gallery of 12 related photos. This is a ".pdf" file which uses Adobe Acrobat Reader viewing software - if you don't have it, use the link button at right to download it for free. "Mission to North Russia - VFW members return to a distant battlefield to recover the remains of American soldiers who died in a forgotten campaign after WWI"
by Herbert M. Mason, Jr., VFW Magazine, April 1999. "120.13 Records of the American Expeditionary Forces, North Russia" - here you will find a brief description of the records available at the U.S. National Archives and Records Administration facility in College Park, MD (NARA II). Did the U.S. Government knowingly leave POW/MIA's behind in North Russia and Siberia? 934 visitors and 1,143 page views were recorded between July 6, 2002 and May 27, 2004 when this site meter was installed.